It’s fall!! I love fall, especially all the pumpkin things. And the changing leaves. And the cooler days. But mostly, all the pumpkin things. I’m still waiting for my first Starbucks pumpkin spice latte though. I’ve tried to get one and they were all out. I really don’t think they should let that be a possibility when they make us wait all year for them, do you?! I guess I’ll just have to learn how to make them at home, it would actually probably be better anyways! But for now, it’s regular coffee with this amazing whole wheat pumpkin bread. On a whim, I decided to not put any oil or butter in this loaf, just to see. I actually kind of expected it to be dry, but figured it was worth a try to make it really healthy, since I thought the pumpkin and yogurt in it might tenderize it enough. It was a good call. This loaf is whole wheat, has no added fat (besides the milk fat in the yogurt), and only 1/2 a cup of brown sugar. And it’s not dry. Not at all. It was tender and full of flavour from the pumpkin and spices, and it did not last long at our house. Now of course I couldn’t leave well enough alone and had to un-healthy it by adding a glaze after I made it all healthy and stuff. But that’s okay, I tried it both ways, and if you want a really healthy pumpkin loaf, leave the glaze off and it will be just fine. Better than fine, it was really good without it. But with it? Amazing. 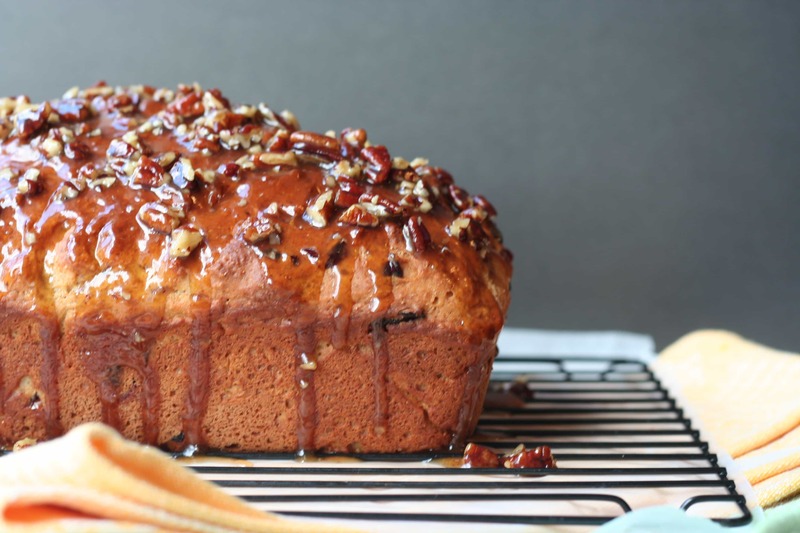 A brown sugar maple pecan glaze that adds the perfect finishing touch to this loaf of bread. And you don’t even have to feel guilty about it because the bread itself is so darn healthy. Am I right? Note: This bread is very good without the glaze as well if you want it to be a bit healthier, and completely guilt free! Preheat the oven to 350 degrees F. Lightly spray a 9x5 inch loaf pan with non-stick spray and set aside. In a large bowl, whisk together the all-purpose flour, whole wheat flour, baking powder, baking soda, pumpkin pie spice and cinnamon. In another bowl, whisk together the pumpkin puree, brown sugar, eggs, yogurt and vanilla until well combined. Pour the wet ingredients into the flour mixture and stir until just combined. Do not overmix. Pour the batter into the prepared loaf pan and bake for 50-55 minutes until it is golden brown and a toothpick inserted in the middle of the loaf comes out clean. While the loaf is baking, prepare the glaze. In a saucepan over medium heat, combine the butter, brown sugar, maple syrup and pecans. While stirring constantly, bring the liquid to a low boil. Allow to boil for about 2 minutes, stirring constantly, or until it darkens in colour. Remove from the heat. When the loaf comes out of the oven, pour the glaze over the top, spreading it around to cover the top of the bread. Allow to cool, the glaze will harden slightly, before slicing. Thanks Tina! I love pumpkin bread too, I get so excited when fall is here so I can make all the pumpkin things again! Just in time to use some leftover pumpkin puree. Love the flavors of this bread, I can only imagine how good this tastes with a cup of milk or tea in the morning or afternoon. Yum! Thanks Oana! Hope you like it!